House training your dog can be a difficult, frustrating process, and time and patients are key. Using a crate at night and when you aren't able to keep an eye on your dog is very helpful. A crate will teach your dog to hold it until they are let out of the crate, a dog should be taken outside as soon as they are let out from their crate and praised for going to the bathroom outside. For more tips on how to house train your dog give me a call at (413) 525-9888. Dogs bark, but excessive barking can be an issue. The first step is to determine why your dog is barking, are they lonely, bored, frustrated or frightened? Then the next step is to correct that behavior, give me a call at (413) 525-9888 and we can determine the best training technique for your dog. A dog's aggression toward other dogs can come from their natural desire to determine social rank. Early and ongoing socialization plays a key role in preventing your dog's aggression towards others. When training with me, you will learn engagement techniques that will condition your dog to pay attention to you at all times and to let the world go by without reacting aggressively or negatively. Private Sessions are by the hour at $95.00 per. Once we have the initial training session, I will have a better view of what will be needed. We can then come up with a good plan and schedule more sessions if needed. 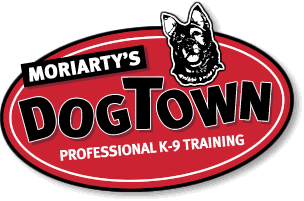 Give me a call at (413) 525-9888 and we can determine the best training techniques for your dog. Due to the tremendous increase in requests for private training sessions, I am not offering any group classes at this time. Absolutely! I strongly advise people with good working/high energy dogs to compete in some venue at some level. I have experience in many areas, from Rally trials to working dog sports. I truly enjoy working with folks in this area and helping them compete and achieve success! I have had a great deal of success working with dog aggressive dogs at local dog parks. This may seem strange at first but works very well. We DO NOT enter the park with the aggressive dog. We do all work on the outside of the fence at a safe distance. We work the dogs using HIGH VALUE food reward, or toy, and the correct equipment for management. We teach the dog that if he stays in a calm, clear state of mind, he earns a great reward. They quickly learn, when around other dogs, great things come from their handler.This, in turn, teaches the dog to pay attention to its handler and not the other dogs. I have been working with dogs in one aspect or another for 40 years, at the professional level since 1991.